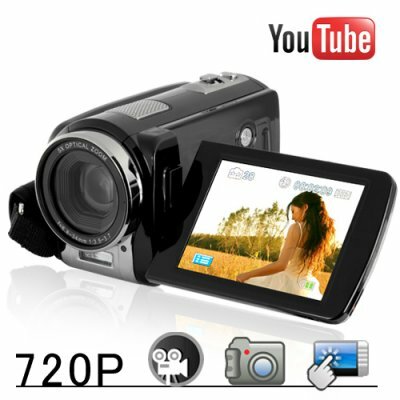 Successfully Added Youtube Direct 720P Touchscreen HD Camcorder (20x Zoom) to your Shopping Cart. Finally, a 720p HD camcorder for the social media set! Check it out, this baby shoots 720p videos, takes 12 MP photos, and connects directly to Youtube for lightning fast and hassle free uploading. The CVGT-DV16 makes it super easy to direct online viral videos! In fact, we think there's definitely stardom in your future! Small and compact, this video camera fits nicely in the palm of your hand. It's solid and well-built. More importantly, all the buttons are where they should be! Flip open the brilliant 3 inch LCD screen and...yes, it's a touchscreen. This way you can film with your right hand and operate the settings with your left. The CVGT-DV16 comes with a topside microphone, a powerful flash, and even outputs via HDMI slot to your high definition TV. Watch Timmy score the winning soccer goal or see Melissa perform Twinkle Twinkle Little Star in front of a packed gymnasium in full HD brilliance! There's more! The CVGT-DV16 also comes with 20x total zoom (5x optical and 4x digital) for absolute control over your subject and environment. Best of all, it features a true 5MP CMOS lens so you get top end 720p videos and 12MP still photos. When you're ready for uploading to Youtube, simply attach the camcorder via USB to your PC and launch the bundled software. The software automatically logs into your Youtube account for you and gives you a thumbnail display of all the videos in camcorder memory. Just click on the video you want and hit upload. It's easy as 1, 2, 3! Christmas is just around the corner so act quick before they're all gone. In fact, buy one to film Christmas Dinner with mom and dad and John, Debbie and the kids! Then buy a dozen to resell on your online store to pay down your Xmas credit card bills. This and a complete line of awesome camcorders are available at chinavasion.com - your online source for direct from China wholesale electronics. Creates 720p high definition videos! Dominate the blogosphere and social media with this cutting edge digital camcorder! Supercharge your Facebook page with the Youtube Direct camcorder! Turbo-boost your Tweets and become a Twitter power-user!